If you were Vladimir Putin, or President Xi of China, what would you do if you had the entire archive of Hillary Clinton’s emails, classified and unclassified, “deleted” and not, in your hands? What value to you would that be in your next round of negotiations with the president of the United States? They are not complete amateurs. The FBI director was generous in his assessment. See, no hacking was really necessary. Online security company Venafi TrustNet has the world’s largest database of digital certificates and associated metadata, allowing it to go back in time and identify how digital certificates were used in the past, a kind of forensics capability for IT security. Here’s what they found on the clintonemail.com server, and it is not good. Using non-intrusive Internet scanning tests routinely performed throughout by IT security teams (meaning foreign intelligence agencies have them too), Venafi learned the Clinton server was enabled for logging in via web browser, smartphone, Blackberry, and tablet. That automatically makes it vulnerable to interception, as the information Clinton was sending and receiving abroad was traveling via other nations’ web infrastructure and open-air cellular networks. Clinton’s email log-in page was also on the web, meaning anyone who stumbled on it could try and log in, or employ the standard array of password hacking and brute force attacks against it, much like they did with your Gmail account that was hacked. The Clinton email setup also was initially running a standalone Microsoft Windows Server, which is very vulnerable to attack, with at least 800 known trojans/spyware in existence that can steal keys and certificates. If the credentials on the server were compromised in those first three months, then the next years of encryption might have meant nothing. How could someone have gained access to the credentials? Clinton’s most recent digital security certificate was issued by GoDaddy. Her domain’s landing page was at one time hosted by Confluence Networks, a web firm in the British Virgin Islands. If anyone had picked up Clinton’s emails from the airwaves or in transit over the Internet (as we know, via Snowden, the NSA does), while they were encrypted, or had acquired the encrypted versions and used the resources of a state security apparatus to decrypt them, there would of course be no forensic evidence to find. Persons working at NSA-like levels actually breaking into systems expend significant energies hiding their intrusions, and such high level “hacks” have been known to stay hidden for years. Sure, if the standard is a “smoking gun,” there is none. But such proof is rarely available in the world of global espionage, and decisions and conclusions are made accordingly on a daily basis. Clinton’s email was extremely vulnerable, and her decision to run it off a private server put at significant risk the security of the United States. This is not a partisan attack or a conspiracy; it is technology. Supposedly Guccifer, the unemployed cab driver who hacked the political establishment in his down time (see why politicians need to get in gear and develop an employment program?) released to Russia Today a mess of Sydney Blumenthal emails on Benghazi to Clinton, as well as other Russian media. I saw articles where Guccifer, after his arrest, claimed the emails are not legit but probably was told to say that to mitigate his sentence. He is in a Virginia jail somewhere. Let’s see if he gets US permanent residency upon his release. Let’s see what low level employee gets thrown under the bus too so it can be claimed, the investigation was a success!! Peter, the questions in your first paragraph are excellent and deserve further exploration. Putin (or Xi) is unlikely to announce that they hacked HRC’s emails, unless as an “October Surprise” if he wants to help Trump. But many threats remain. 1) the identities of covert operatives and their contacts may have been revealed, leaving them vulnerable to pressure. 2) Given the tangling of official USG business with Clinton Foundation matters, anyone anywhere in an email chain could be exploited by a foreign intelligence service, including by ‘false flag’ or NOC operatives. 3) The look inside how State, the NSC, DOD and the IC interact would be fascinating to a foreign intelligence service, even a friendly one. I bet NSA would absolutely love to have such a window into decision-making in Moscow or Beijing. Yep. That’s why she should be in jail. She gave away more useful info than the Russians and Chinese and… could have ever hoped to gather. 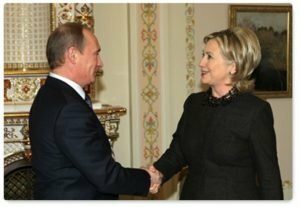 They may have also used her server to plant spyware in other computers. Meanwhile, we all know the NSA has to have information and won’t release it. That gives them a heavy hammer to use against President Hillary. If this person is in jail it must be a really nice cell. She skate away from this right into potus and not jail. I’ve read that her computer and email didn’t even have the most basic protection: she didn’t use passwords. Polanski’s THE GHOST WRITER might be an interesting viewing for most. Disurbing to say the least. It came out in 2010 and now Blair is under scrutiny. I still wonder why the NSA didn’t want a Secretary of State to have a secure Blackberry like Obama. That was what caused this whole debacle. This tells me something. I mean, the entire planet knows the NSA has every word she spoke and every email sent and received. Even the deleted ones. They are hiding something. ps..I wouldn’t doubt that this was a dis-information plot. The REAL emails are probably held on a classified TOP SECRET server. This is the only reason I can fathom why she is not being prosecuted. Moreover, top officials such as Comey and Lynch, have probably already informed the IC committees and this is why no one on those committees have said a word about this debacle. The rest of the Congress be damned. Pitch- we all hope somebody will break ranks and give the general public the “truth” but these are hard times and those working for government are not going to derail themselves from the pension track. They also plan on continuing doing similar work in the private sector once retired. Having a steady gig at the FBI, CIA, DS, SS is too valuable to give up or jeapordize. I think greed explains this frustrating dynamic. A guy will work at DS for 25 years and then plan on making even better money in the private sector even though his pension and perks would certainly be adequate. They can’t transition to the private sector which also worships secrecy unless they are a proven team player. Speaking of “hacks,” Newt the Nut Gingrich will be a featured speaker at the RNC nuthouse. Can’t wait to hear his featured nuthouse talking point – deporting EVERY Muslim – including US citizens – who believe in Sharia law. The RNC couldn’t get Joseph Goebbels. What constitutional laws does Nut Gingrich believe? So where is Brian Pagliano? Oh, I forgot, he isn’t talking. Sociopaths like Hillary are an easy read. Their sycophants are a more interesting and vexing study. Then, where Are The WORLDWIDE DISCLAIMERS 0n CLINTON Precedency “qualifications”?